Recently I went back to read the Heritage position paper, Ten Myths About the Bush Tax Cuts. I was bothered by many of the premises of the Obama stimulus package. They seem to run counter to recent economic history. Here are some highlights from the paper. The tax cuts shifted even more of the income tax burden toward the rich. Whether you look at the Bush tax cuts or the Reagan tax cuts you have to agree they were successful at stimulating the economy and reducing unemployment. What bothered me was that despite the advantage of history, the Obama administration chose a different economic plan. Instead of putting together an economic plan that stole the best ideas from Reagan and Bush plans, they cobbled up an economic plan that is most similar to a plan that is generally regarded as an economic failure, FDR’s New Deal plan. The reactions by the stock market and businesses were predictable and swift. Businesses decided that they needed to go into survival mode. Business leaders concluded that there was nothing in the stimulus plan to give them hope for the near term. What they saw was an above average chance of inflation without economic growth. So they laid off employees and cut costs. It was obvious that they expected that it was going to be quite some time before their sales recovered. As they scaled back operations the rest of the economy the rest of the economy followed in close pursuit. The business leaders did not like what they were doing but they could not ignore the possibility that things were going drastically wrong. Businesses were not alone with their pessimism about the economic future. Warren Buffet is scared. Our bankers, the Chinese, are panicking but are unable to do anything to stop it except to lower the maturity of their dollar denominated holdings. This fear was avoidable but the Obama administration dropped the ball. They pandered to the fear to gather public support for the stimulus package. Then they tried to turn off the fear and put it back into the can. In one moment they wanted everyone to be scared. In the next moment they were looking in dismay at an economy that remained fearful and had lost its trust that the government would do the right thing in a financial panic. Obama and the Democratic party were hopeful they would get long term benefits as the savior from the economic crisis. Now the Democratic party looks like it will get most of the blame if the economy and the unemployment does not recover quickly. Already the average person is quickly losing their appetite for the one party system. Our experiment with the one party system was a terrible failure. The question is not whether the public will start placing blame for the crisis on the ineptitude of the Democratic party and the one party system but when. A recent generic voter polls indicate that the independent voters are swinging their votes to Republican candidates over Democratic candidates for the first time in the history of poll. If the unemployment rate is still hovering around 10% with no economic growth on the horizon, the 2010 elections might tell a dramatically different story. The problem for Obama and the Democratic party is that they keep on providing more fuel for the argument that they are incompetent at managing the crisis. I have begun to wonder whether this administration is the most incompetent administration since President Carter. The similarities between the two administrations are eerie. It is really to soon to give the Obama administration the crown but they have demonstrated an unusual aptitude for screwing up. The AIG affair is a case in point. Recently they made some political points by demonizing AIG executives for the bonuses they were receiving. It should come as no surprise that some of those officials are now leaving. These were the executives who were trying to wind down the AIG mess that is projected to cost the tax payer about 180 Billion dollars. So to recover $150 million we are willing to risk $180 billion. AIG says their employee situation is “manageable” but everyone knows that they are being forced to play a very complex game with their second string. It is increasingly likely that the gambit to sell off parts of the company to repay the government is doomed to failure. The more serious problem for the Obama administration is that the financial community is viewing the administration as an adversary rather than a partner. The bill recently passed to tax bonuses at 90% for all financial firms that took TARP money is an ominous sign. The reaction by the banks has been predictable. Any bank that took TARP money is now frantically trying to pay the money back as soon as possible. The unintended consequence of the AIG bonus affair is that the penalty for bankers making risky loans has gotten much higher. The banker’s worst fear is that they will make a bad loan to a business and the government will see that as an excuse to come in and micromanage their business. The cool reaction by the banks shows that they do not trust the Obama administration. As a result the banks are likely to continue to be suspicious of undertaking any additional credit risk when the political risks are so high. Those businesses who desperately need the loans are probably going to find the that credit markets might have actually gotten tighter. This adversarial relationship between the government and the financial community was unnecessary and further prolongs the credit crunch for businesses. There was a real lack of leadership on this issue by the administration. It should be interesting to see how long it takes for the Treasury Department to fill its posts. If the economy was not a big enough problem, the Obama administration has decided to start up the political battles on health care and global warming. Either one of these issues could unravel a new administration under good circumstances. Taking on all three divisive issues at the same time in our economic condition is going to be distracting for the administration. It probably will be political suicide for these issues. With the way they are thinking I am surprised they did not bring up the race issue, too. The inescapable fact is that the Obama administration owns the deficit problem. 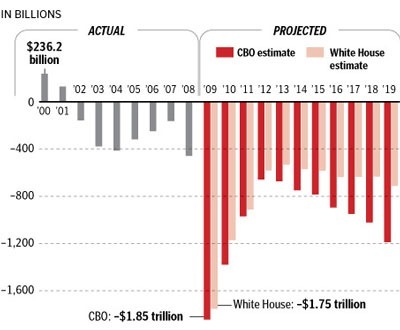 This graphic from the Heritage article, Bush Deficit vs. Obama Deficit in Pictures, leaves no doubt in my mind who owns the deficit. The best and brightest minds that supposedly surrounding President Obama appear to be missing in action. Finally my greatest fear with electing President Obama was that he was too inexperienced to deal with the major issues and Congress would eat his lunch. So far my fear has been realized. President Obama looks like he is in over his head. In demonizing AIG executives he set up Senator Dodd as the sacrificial lamb for the administration. Since the discussion of the bonuses in the Senate offices and at the executive level appear to have been going on since last November, it is really hard for Senator Dodd or the executive branch to claim ignorance. Since Senator Dodd was already looking at a difficult 2010 campaign before the bonus issue raised its ugly head, he looks like the biggest loser in this deal. I doubt this went unnoticed by the rest of the folks in Congress looking at tight political races in 2010. What is missing from the Obama administration is pragmatism. Many of the moderates and independents thought they were getting a pragmatic administration like that under President Clinton. Now these moderates and independents find themselves stuck with an ideological administration and policies. They see the future and they are feeling “buyer’s remorse”. Through this combination and politics the Obama administration has started a tax war with the traditional tax base for the local, state, and federal governments, the wealthy and businesses. These are the people who are going to pay for your plans and you are declaring war on them. They are the Golden Goose of the economy. It should not come as a surprise that the wealthy and businesses are loaded with the best and smartest advisors. History is on the side of the wealthy and businesses. History is full of examples of the clever tax avoidance tactics. This will be a quiet war and it will take some time to play out but it should be an amusing show. Over the next couple of weeks I will try to highlight the unintended effects of the Obama administration policies as they try to kill the Golden Goose.